Today we’re sharing a small, but useful feature update to the Assets module in Syncro. Head to your Syncro account and open the Assets module. Click on the Asset you’d like to merge into another Asset (in other words, the one you are eliminating as a duplicate entry). Use the popup to select the “Final Asset” you’d like to keep in your account, and ensure that the “Asset to Remove” is the one you intended to merge into the Final Asset you’ve chosen. 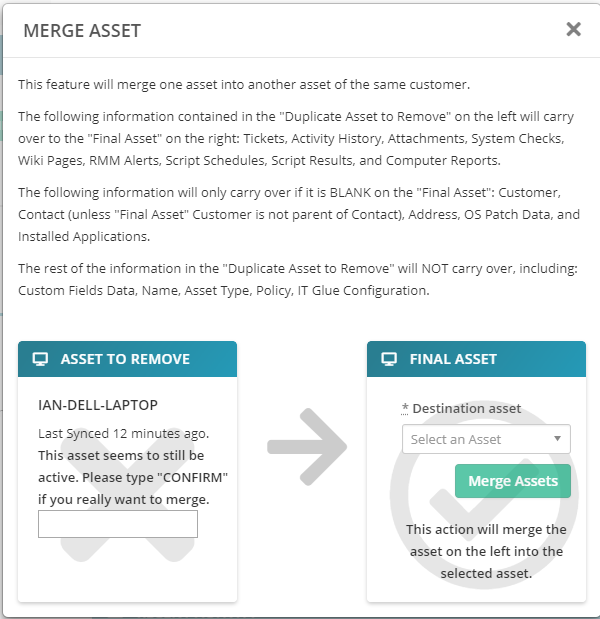 Click the green “Merge Assets” button to finalize the merge! You will see any pertinent information from the duplicate Asset now appear in the Asset Details for the Final Asset.